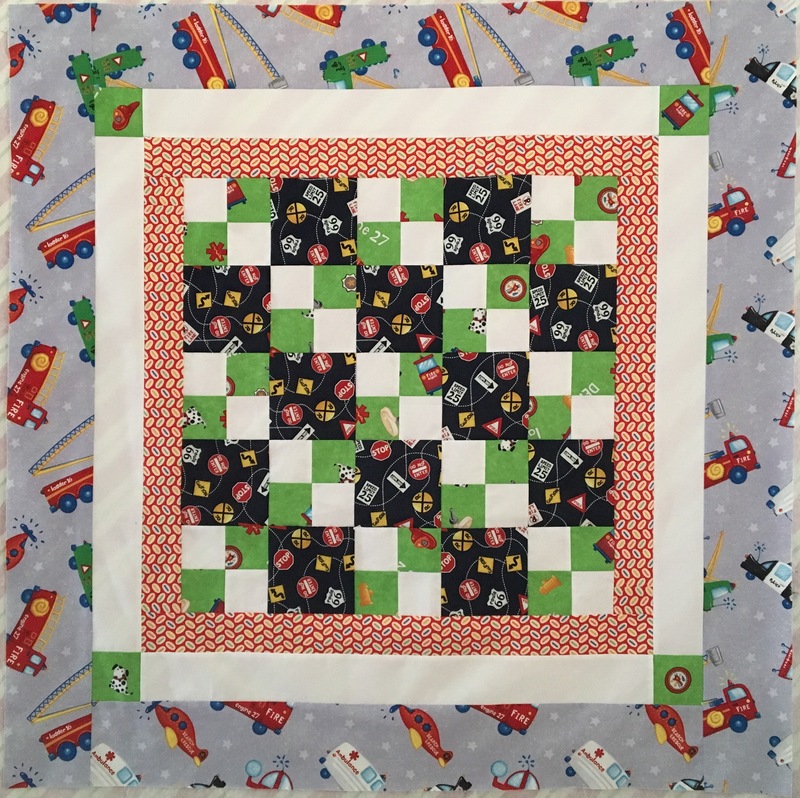 Up, Up and Away quilt. 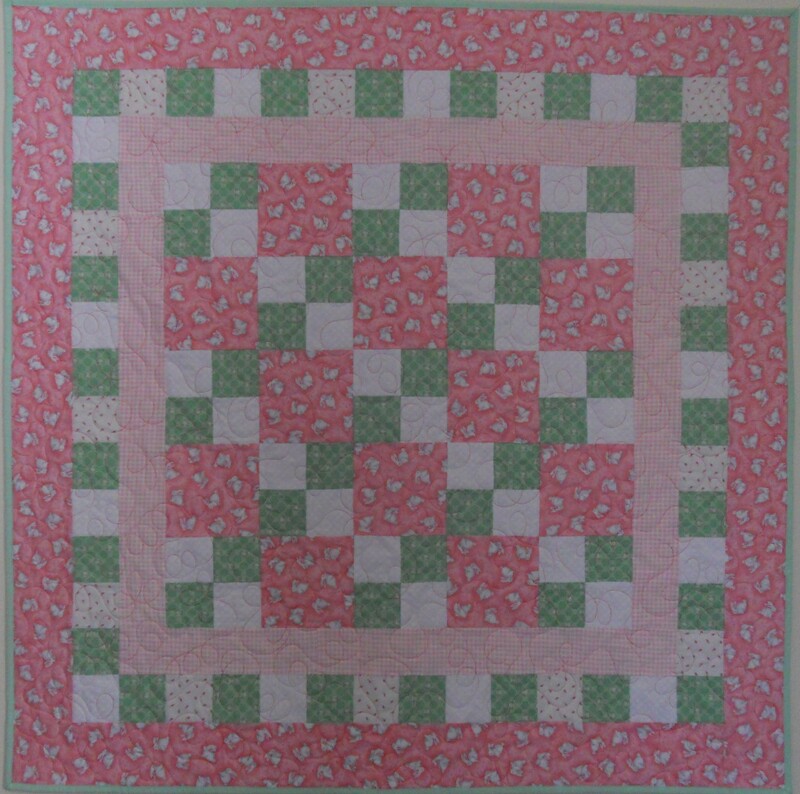 This is a link to instructions for an easy strippy baby quilt designed by Trinity Sanders. 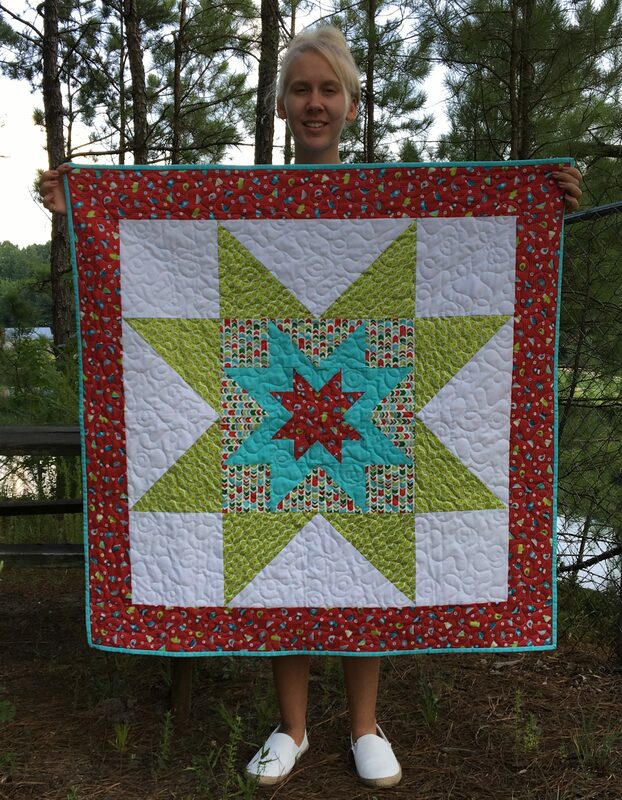 Wonky Star Instructions TQG Raffle Quilt for 2019 This is a link to instructions for making 4 1/2″ x 8 1/2″ Wonky Star blocks. Christmas Triple Star Quilt This is a link to instructions for two Star Quilts. 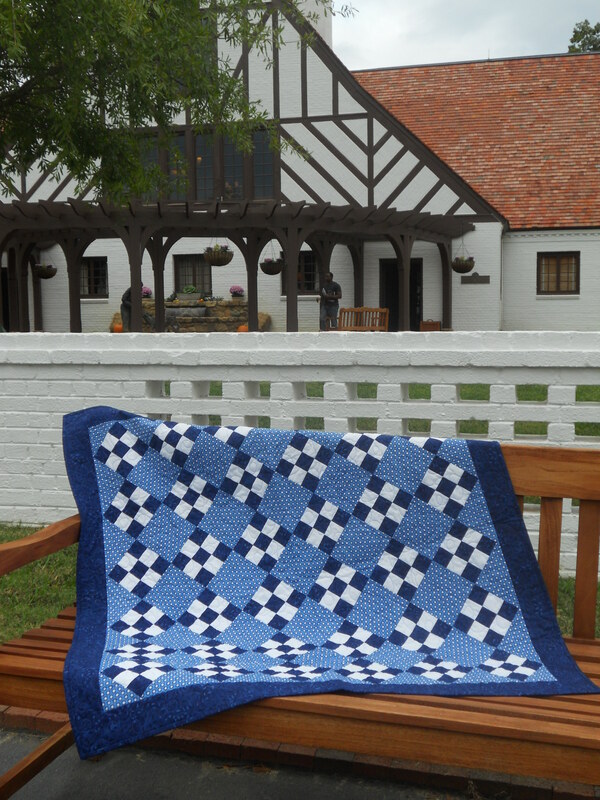 The baby/wall quilt measures 40″ square, and the throw/twin quilt measures 72″ square. Placemats-Easiest-Ever This is a link to instructions for Easy Placemats. Make four 14″ x 18″ mats or six 12″ x 16″ mats from 2 yds. fabric. 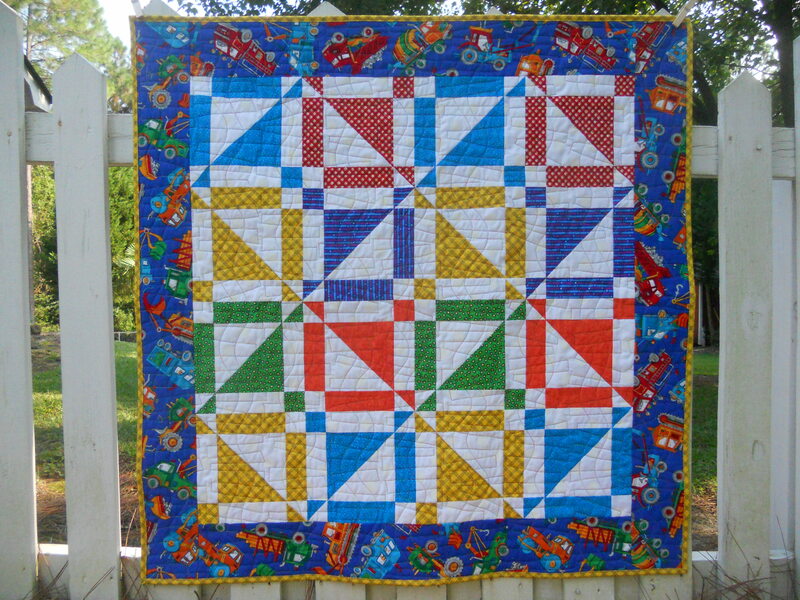 Triple Star Baby Quilt This is a link to instructions for a 40″ x 40″ fat quarter friendly baby quilt. 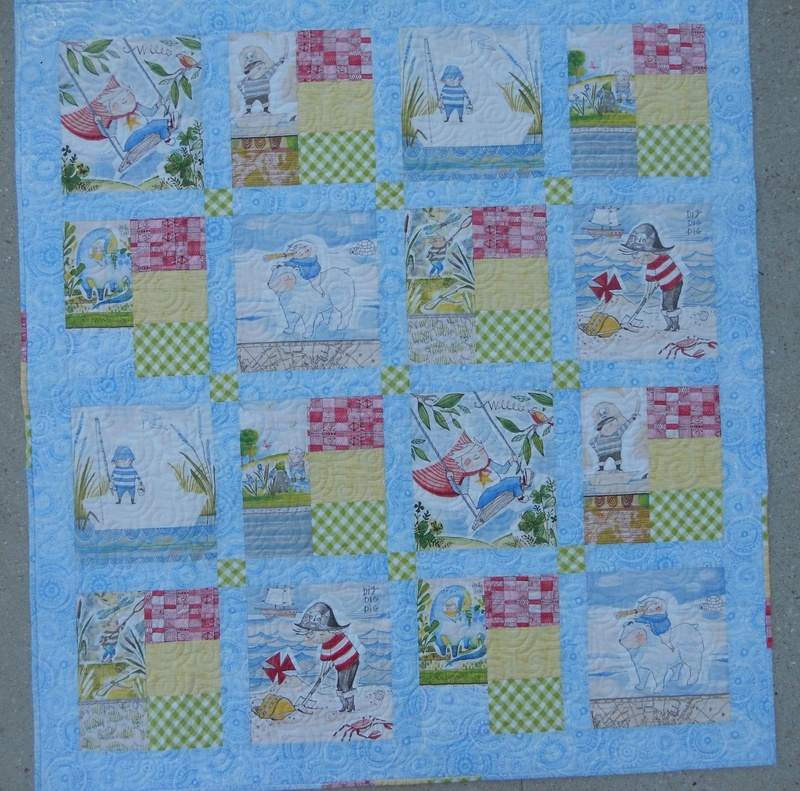 The Adventurers baby quilt. 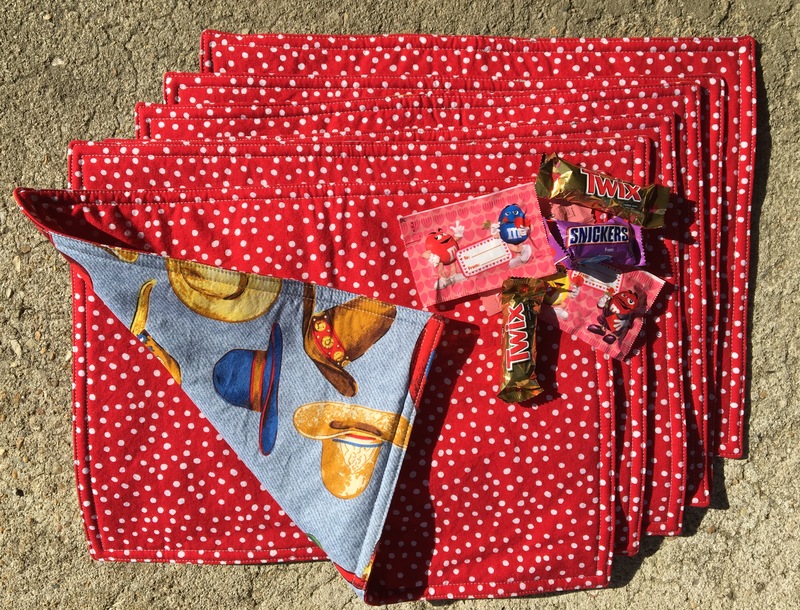 This is a link to instructions for a 52″ x 56″ baby quilt specifically for panels of “The Adventurers” line of fabric. Buzz Saw Workshop, quilt & instructions. This is a link to instructions for 15″ Buzz Saw block which employs an innovative cutting and piecing technique. 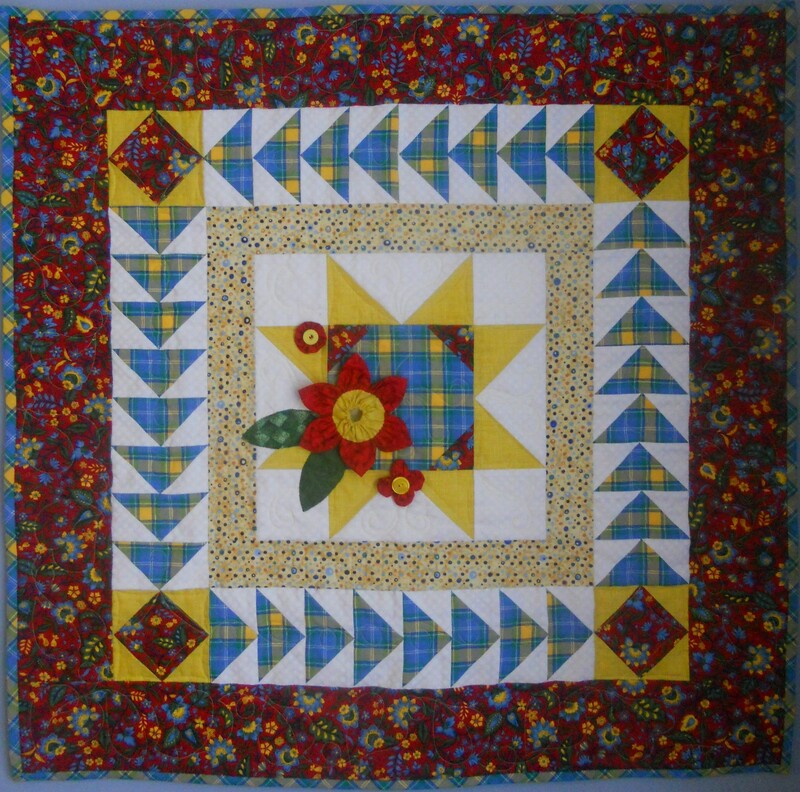 Playtime with Pinwheels Baby Quilt. 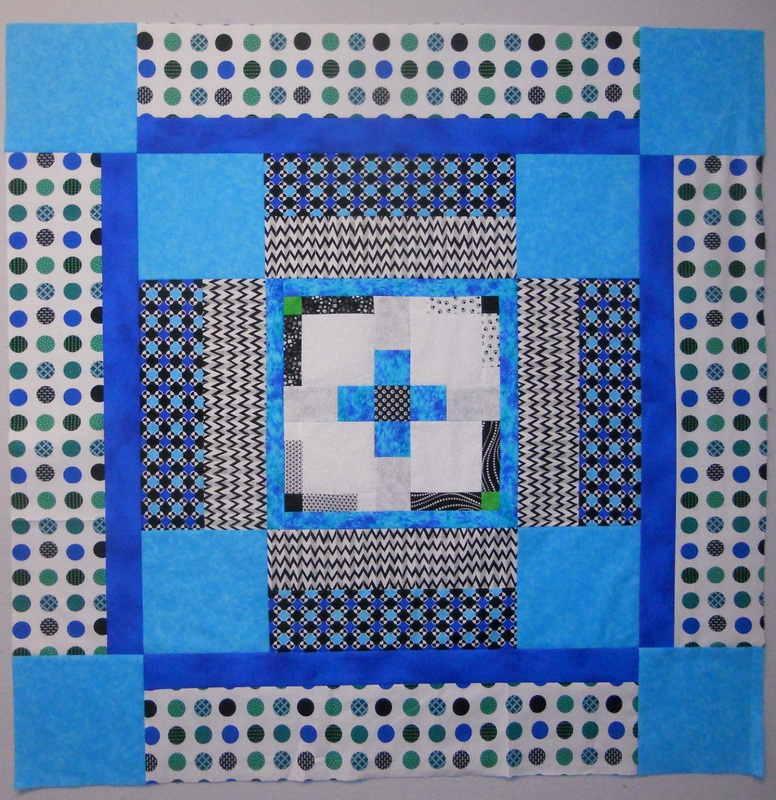 This is a link to a fat quarter friendly baby quilt that measures 40″ square. Strip Pieced Christmas Trees. 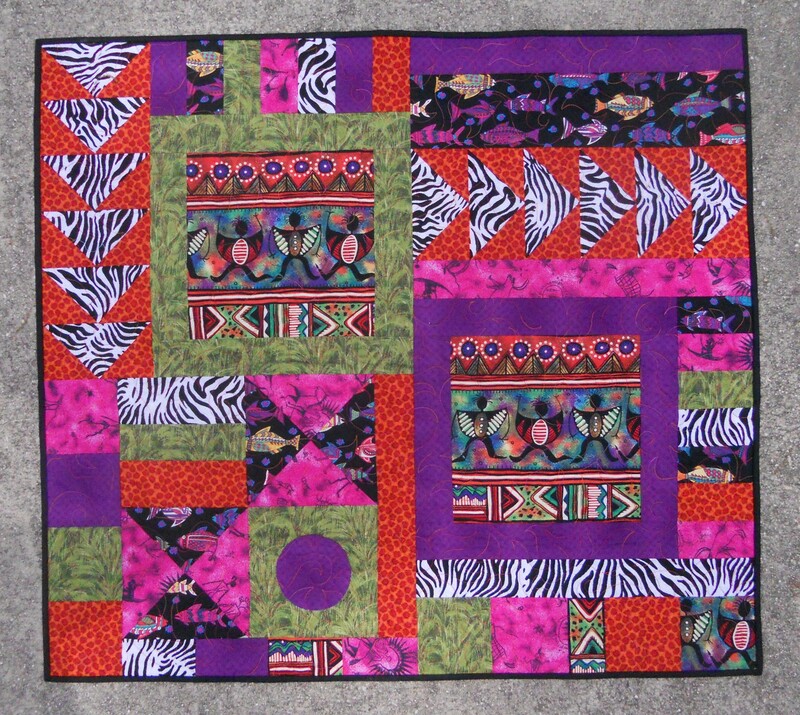 This is a link to the instructions for strip pieced trees. Lickity Split Rail Fence Table Runner. 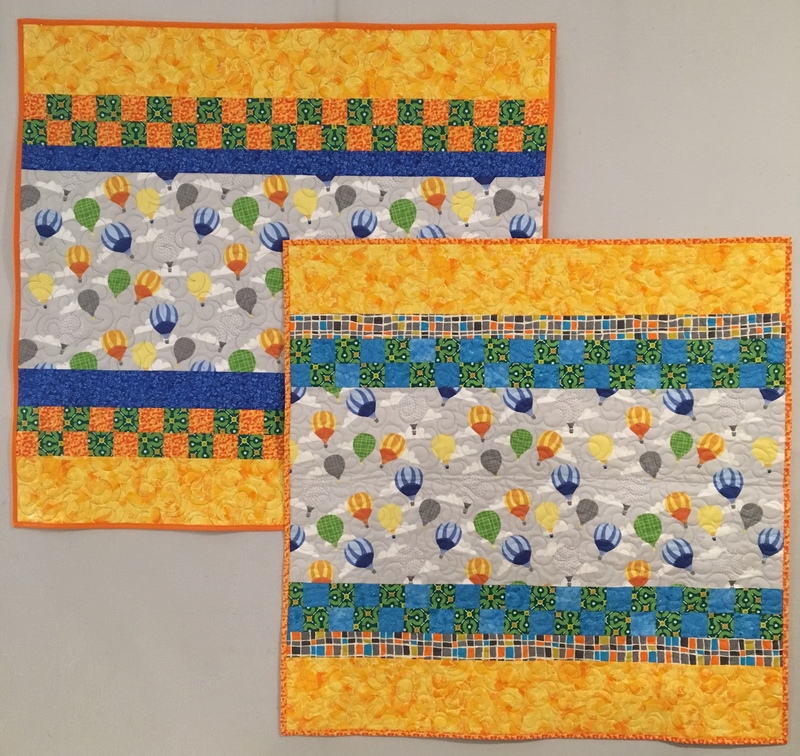 This is a link to the instructions for two Fat Quarter Friendly table runners. One uses 4 fabrics, the other uses 3 fabrics. Spring Migration. 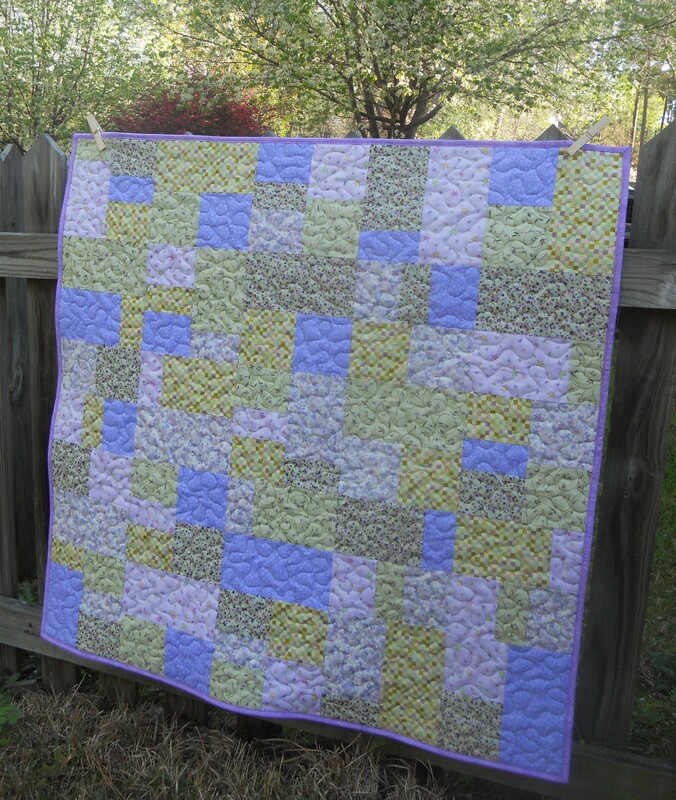 This is a link to the instructions for “Spring Migration,” a Goose in the Pond Quilt-A-Long for Spring 2015. Unlimited Possibilities Tote Bag. 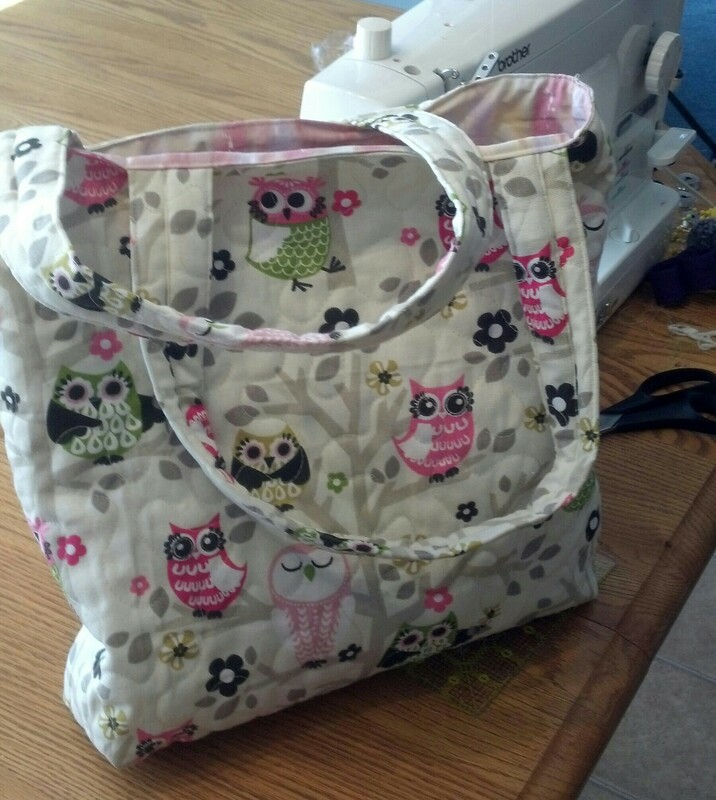 This is a link to a basic tote bag, 14″ x 16″ – great for shopping, quilting projects, or baby’s needs. Library Book Tote for Tots. 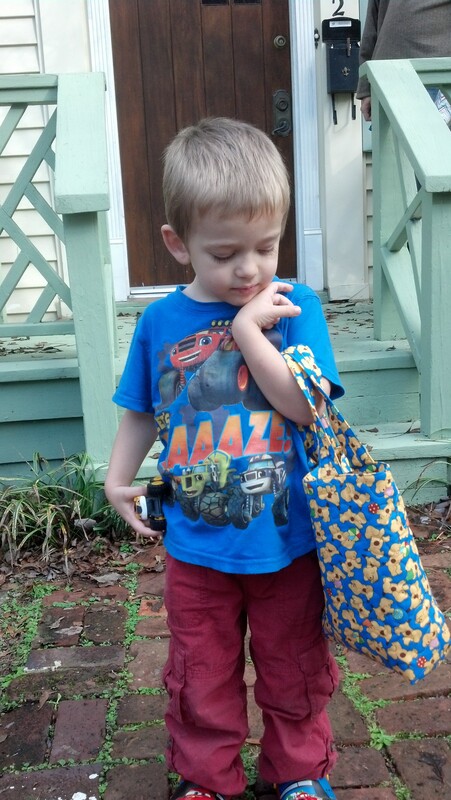 This is a link to instructions for a smaller tote bag suitable for a child’s library book selections or small toys. Make it with just two fat quarters! 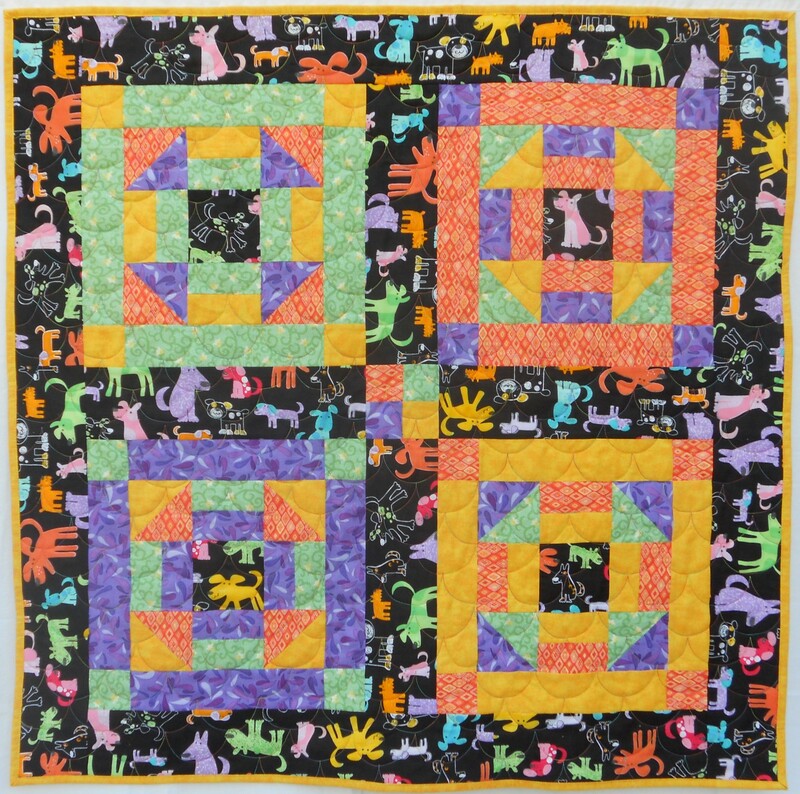 Fun with Fat Quarters-Monkey Shines This is a link to a Layer, Cut, Swap and Sew baby quilt. Steppin Up This is a link for my simple baby quilt, Steppin’ Up. Celebrate Life! 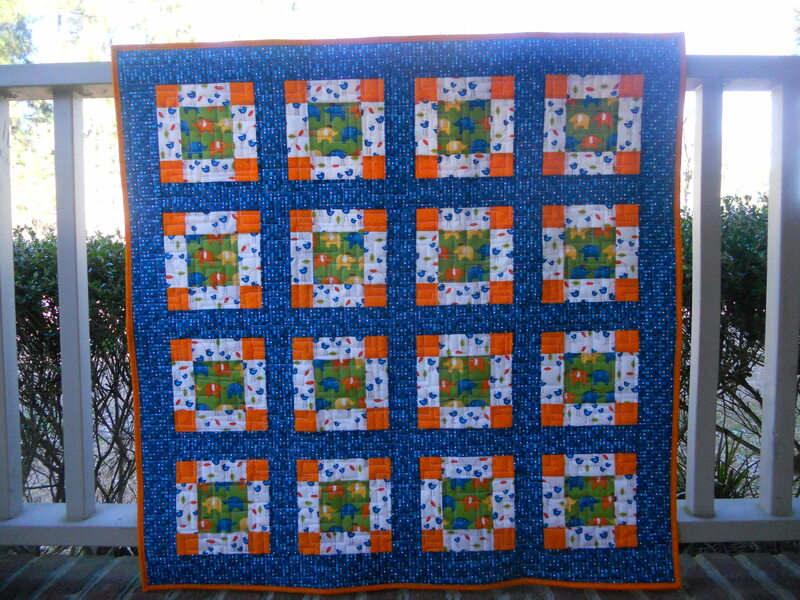 Quilt Click here for a fast and fun baby quilt. Use any 12″ block for the center square. Tribal Fishermen Quilt A modern fat quarter friendly wall quilt. 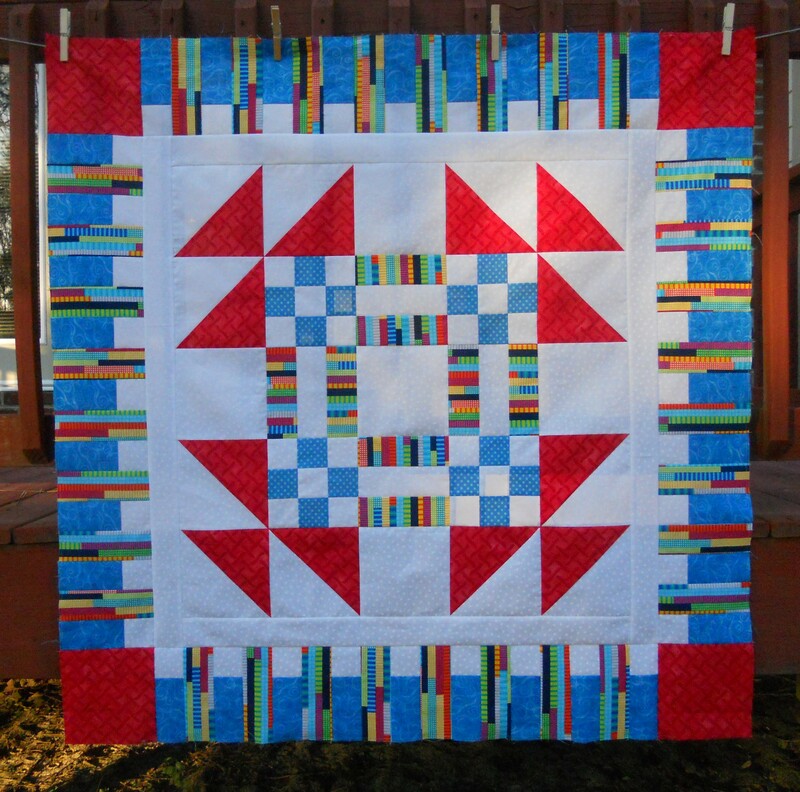 Modern-Baby-Quilt. 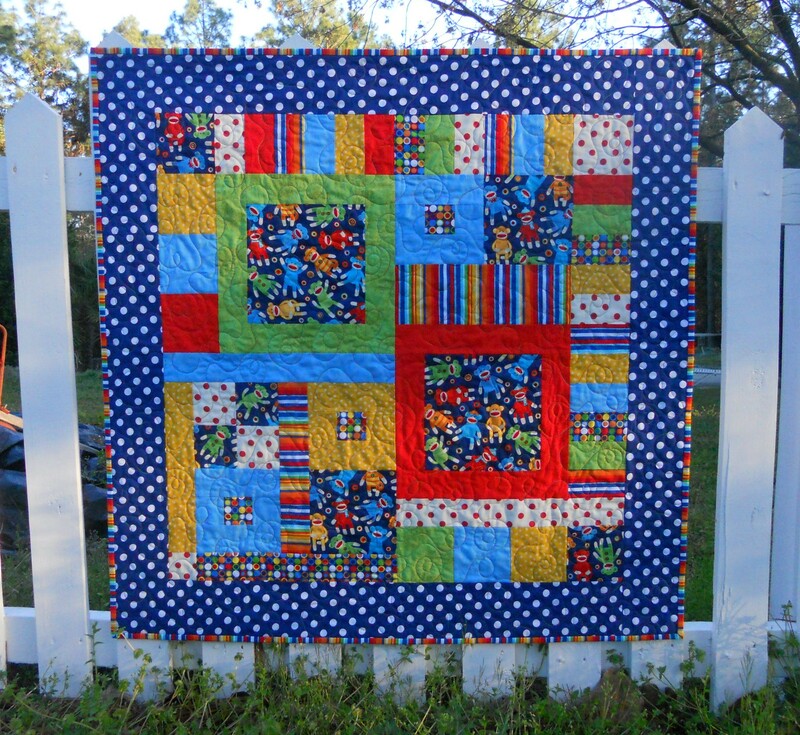 This is a link to “Sock Monkey Circus,” a modern, fat quarter friendly baby quilt. 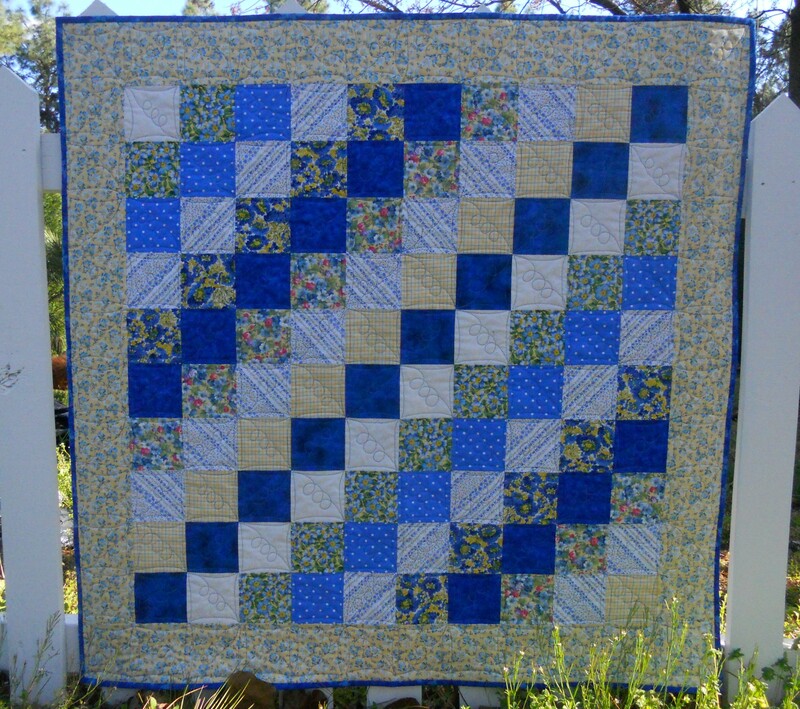 Little Boy Blue-Baby Quilt A Nine Patch quilt in white and blue. Four Patch Baby Quilt 2 A quick and easy project. Slice and Dice-Uneven Nine Patch This is a link to a fat quarter friendly quilt, wall or baby size. Disappearing Half Square Triangle. 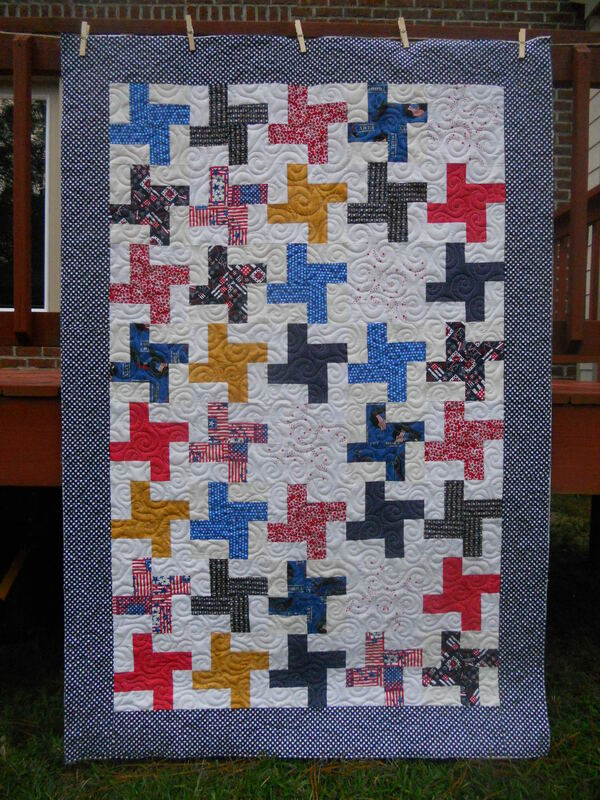 This is a link to a quick and easy 8,” finished, patchwork block. 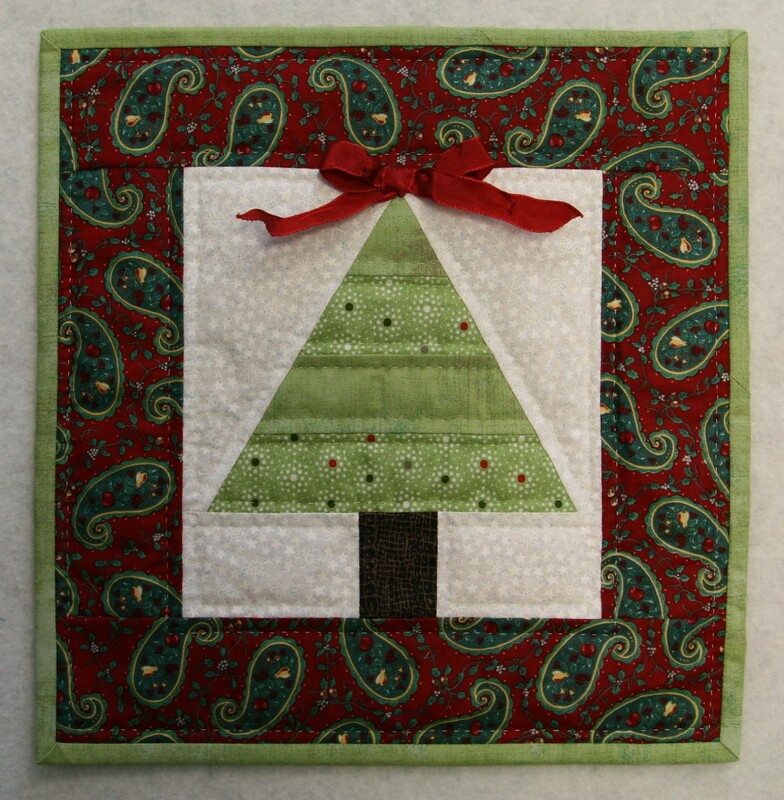 Carolina Pine Tree quilt by Karlene Larson This is a link to a 9″ x 22″ wall banner. Simple Pinwheel Charity Quilt This is a link to a lap quilt. This sample was made by Stacy. Maple Leaf Block This link takes you to a 9″ Maple Leaf Block, written by Karlene Larsen. 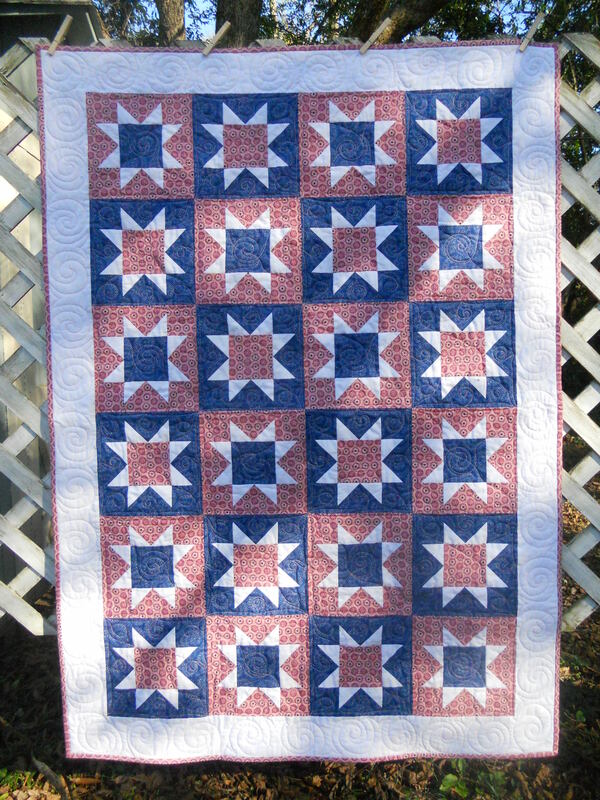 Maple Leaf Table Runner revised This table runner uses the 9″ blocks in the link above. Hi Aby! 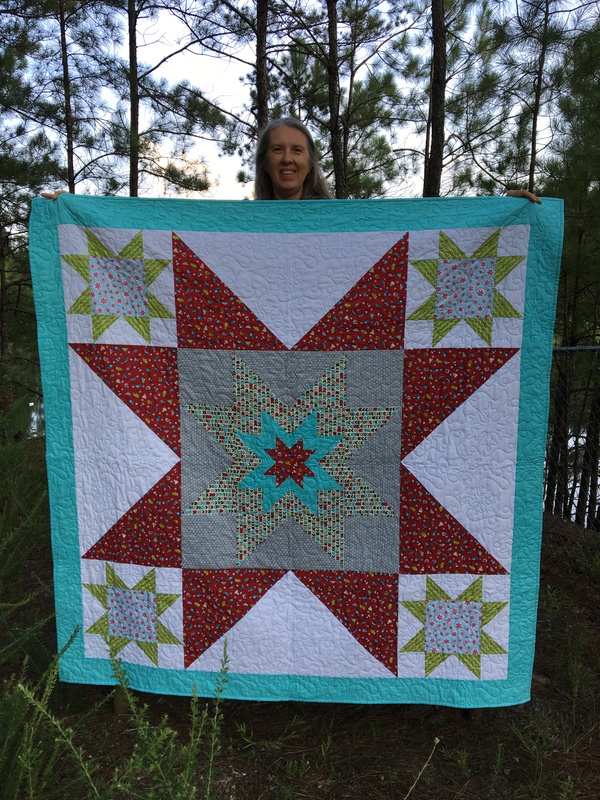 I am the current editor of FaveQuilts.com and would love to feature these free patterns on our site. If you are interested, please get back to me at your earliest convenience! Look closely at the picture in the magazine. Some of the wreaths are made with a holly leaf print on a black background. I suspect the editors called it a “black print” because the background is black. I agree it is a bit confusing. 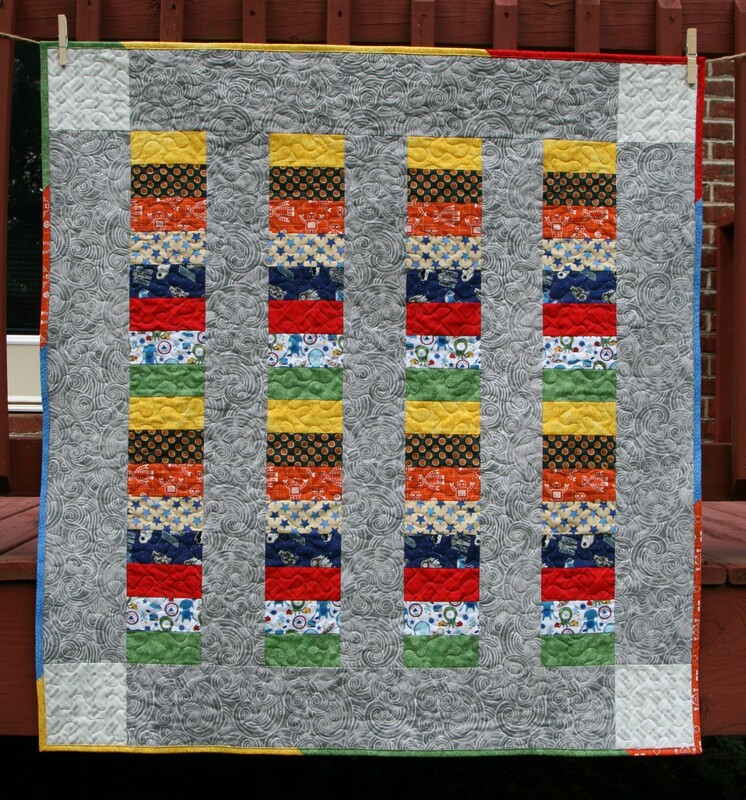 Is there a pattern for the Confetti quilt? 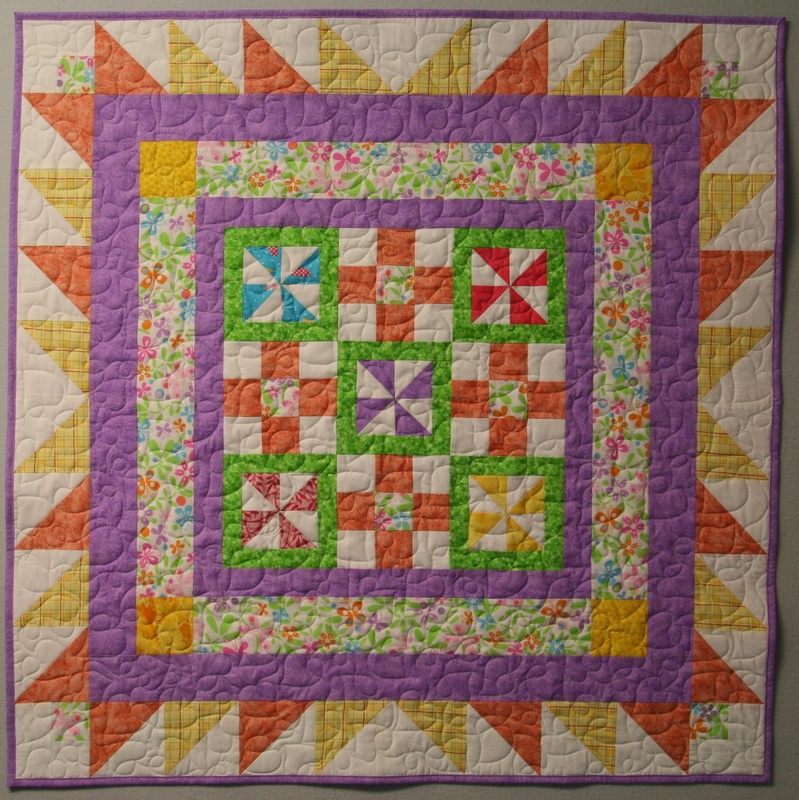 The Confetti quilt was designed by Augusta Cole. You can email her to inquire about purchasing a pattern. Augustacolequilting.com is her website. 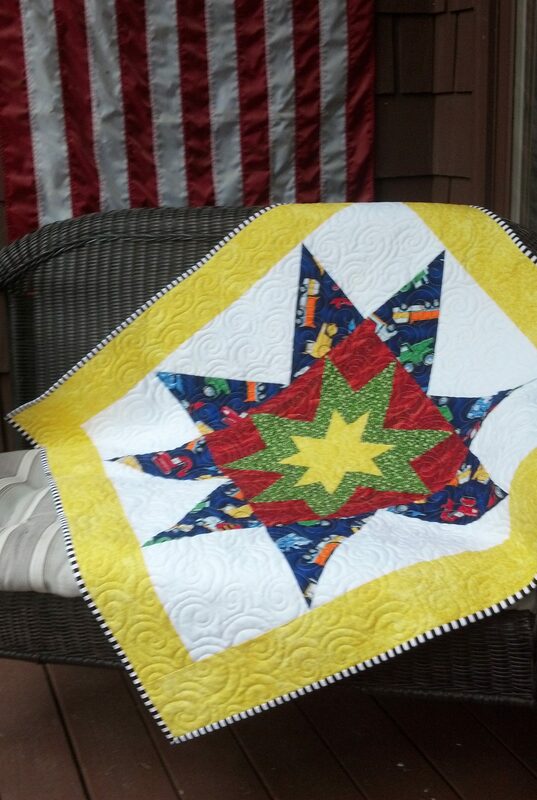 Where are the instructions for the Disappearing Half SquareTriangle Quilt? Corrine, On the home page of my blog are several tabs. Click on “Patterns.” Scroll through a lot of pictured projects. A link to “Disappearing Half Square Triangle” is third from the bottom.